Best Publishing Company - DEPTH Blog - Beyond the Journey. What's Next? Yes, and even find good places to dive in all of them. I'm building a new product that will showcase both video and photography, but first, I'd like to share a few images from travels since the journey ended (images are below). Some of the places I visited were so remarkable, they required a repeat visit. In Tennessee, I again visited the paddlefish in Loch-Low Minn quarry. I continue diving in Balmorhea with the endangered Comanche Springs pupfish and soft-shell turtles. I'm also creating images from around the world as I visit the California sea lions in Los Islotes, whale sharks in Isla Mujeres, and destinations in Asia. Find updates to these adventures through Jennifer's social media feeds, on her personal Facebook, or as The Underwater Designer and An American Immersion. Follow @uwDesigner on Instagram. Jennifer Idol, is an adventurer, explorer, entrepreneur, the first woman to dive 50 states and author of An American Immersion. 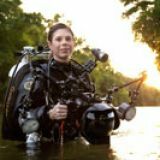 Her photography and articles are published in DIVER, Sport Diver, Alert Diver, SCUBA Diving, X-Ray Mag, Outdoor Oklahoma, SCUBA & H2O Adventure, and Texas Aquatic Science. Her work has been featured in competitions and exhibits across the country. Monday, 15 May 2017 Do Nudibranchs Have a Front and a Back? Monday, 17 April 2017 Beyond the Journey. What's Next? You're Exclusive Sneak Peek . . .!